Airship Ventures: California, here we come! CNS is back from their fligjt. John had the distinction of being the first passenger in the US. We're on our way to Palm Springs, California. 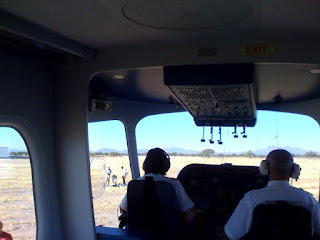 It was great to see the airship in Marana, both the John Blackstone flight and the departure. It. is. so. big. (even from a distance!) Thanks for giving us Tucsonans a chance to gawk!